TechnoProzium: Zen evolves: AMD has Ryzen! AMD’s upcoming Zen core-architecture has grabbed a lot of attention recently and with good reasons too. Zen is not only the brand new x86 micro-architecture from AMD in a long time; it also has the difficult yet important task of bringing the competition back into the enthusiast space. The competition that was still there back in the K10/K12 days, resulting in some fine line of CPUs like Phenom and Thuban. Since then however things have been downhill for AMD. FX processors based on Bulldozer, the company’s last generation micro-architecture didn’t fare well and while Piledriver, its eventual update, improved performance a bit it was nowhere near challenging Intel’s supremacy. Whether Zen is going to change all that is a million rupee question and to get the answer we have to wait till the 1st quarter of 2017 when the Summit Ridge platform (Zen + AM4 motherboards) will be made available for mass market. For now we know this – it’ll be called Ryzen and it can go toe-to-toe with an Intel i7-6900K! Last week AMD hosted an event dubbed New Horizon in Austin, Texas to shed new lights on some of the specs, features and performance of the upcoming release. So without wasting anytime, let’s delve into the details. First of all – "Zen" has evolved into "Ryzen"! No, it’s not some kind of a new Pokemon if that’s what you’ve been wondering about; rather, it’s the name under which the first products based on Zen architecture will see the light of day. This may sound a bit confusing to the uninitiated but that’s how things are in the semiconductor industry – lots of codes and lots of names! For now just remember that the underlying architecture is still the same old Zen but the new series of processors based on it are going to be branded as Ryzen. Does that mean that AMD is going to ditch the “FX” moniker which the current batches of Vishera CPUs bear? Seems very likely as the company may decide to give the famed “FX” branding a rest after the not so glorious 2nd innings and start things anew with “Ryzen”. There could be more than one high-end processor under the “Ryzen” branding umbrella along with the one that AMD demonstrated in the event. The part in question is an 8-core 16-thread model, clocked at 3.4GHz base frequency and features a whopping 16MB L3 cache (20MB total). The TDP (Thermal Design Power) is a very respectable 95W for such specifications. There is no word on the boost clock although AMD has indicated that the clock frequency could go even higher. 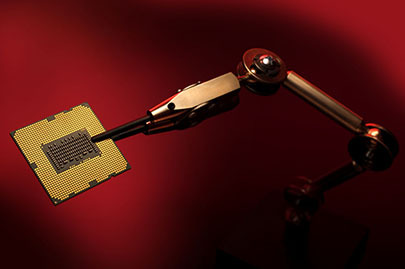 Remember that the silicon isn’t yer ready for the primetime and it wasn’t that long ago when early engineering samples were reported to be operating at around 2.8GHz with AMD itself showing a 3GHz part during IDF. 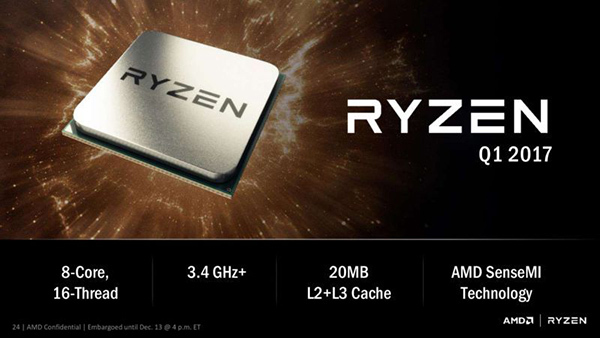 Needless to say the final clock speed will be one of the most interesting aspects of Ryzen launch. These are some striking results even after considering the favorable conditions which are generally associated with such organized demos. Finally, it looks like AMD has done a commendable job of designing a modern efficient processor. You may already know that from an architectural viewpoint Zen/Ryzen is quite a departure from AMD’s recent design philosophy. With the Bulldozer core-architecture AMD went for a “speed-demon” design with deep pipeline resulting in a processor core optimized for high frequencies. But that speed came at the cost of high latency and branch miss-prediction penalties which severely affected the IPC (Instruction per Clock-cycle) throughput. Also, the modular CMT (Clustered Multi Threading) approach of Bulldozer where computing resources are shared within a module, proved inefficient in most single threaded workloads. Piledriver brought some much needed refinement but that didn’t prevent AMD from essentially ceding the high-end of personal computing market to its arch nemesis. The mainstream FX CPUs never received the proposed Steamroller and Excavator upgrades as AMD didn’t thought it to be prudent to invest resources and time into a battle already lost. Instead the engineering team, lead by famous architect Jim Keller, focused its attention on Zen. Zen is much more of a conventional design with a strong emphasis on IPC. In fact AMD claims to deliver a radical 40% throughput gain, clock for clock, when compared to previous generation. 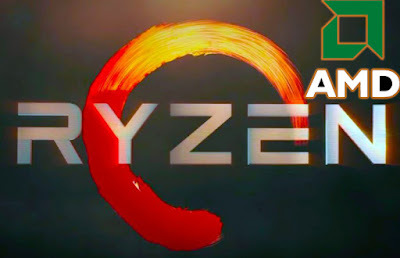 To what extent that promise would realize into practical benchmarks remains to be seen but these early findings indicates that AMD might finally have something big in form of Ryzen in its hand.